Capgemini India is deploying Tata Tigor EVs at its campuses in Bengaluru, Chennai, and Hyderabad. Tata Motors has received a new order for its Tigor all-electric saloon from Capgemini India. The popular multinational IT firm intends to deploy the EVs on its Bengaluru, Chennai, and Hyderabad campuses. 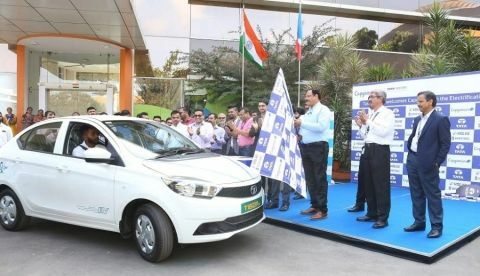 Commenting on the deployment of Tigor EVs, Mr. Shailesh Chandra, President – Electric Mobility Business and Corporate Strategy, Tata Motors, said, "We are delighted to partner with Capgemini on their thoughtful initiative of promoting zero-emission vehicles for the employee mobility needs. Tigor EV, recently awarded as the ‘Electric Car of the Year’ by Assocham India’, will join Capgemini’s existing fleet of cars. Tata Motors will continue to work towards bringing aspirational e-mobility solutions for the customers, leading the drive towards faster adoption of electric vehicles in the country."